Good Morning! 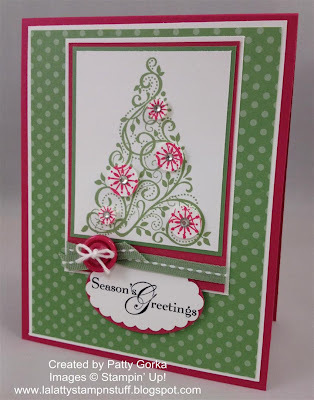 This week's 52 Christmas Card Throwdown blog challenge is a sketch challenge. I love sketch challenges, they are my favorite and this week is a fantastic sketch! Below is a picture of the sketch. The rest of my card was simply a matter of assembling it. My sentiment was stamped and punched out using my scallop oval punch and then layered onto a punched out oval using my wide oval punch. Underneath my sentiment are dimensionals. I hope you have a wonderful day! 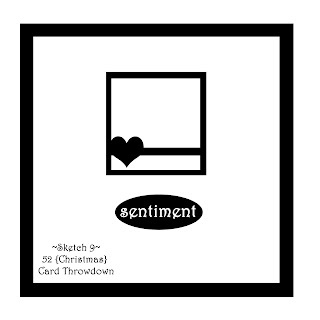 I'm going to try and post another card later today. I need to catch up on my 100 cards in 100 days goal. Be sure to stop on by the 52 Christmas Card Throwdown blog to see the other design team member's cards. Ooohh such a pretty tree and a lovely card! I love your second card too with the snowman and the stitching - super cute! Hugs! Gorgeous card Patty - what a fresh combo Rose Red and Wasabi is! Love how you added the snowflake circles to the tree. We will have the Snow Swirled set in our new annual UK catty - I may just have to get it now!